Living in the country there wasn't a lot of entertainment. I remember riding the bicycle to Castlewellan (10 miles) to see the wedding of Princess Elizabeth, as she then was, in the cinema. 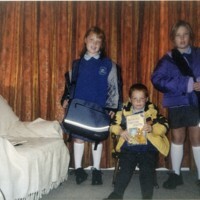 A photo of Maisie McNailly's grandnieces and grandnephew wearing their school uniforms. The first school I attended was Malone P.E. School,Balmoral Avenue,Belfast. I also attended Moybane School,Letterbreen and the Model School,Enniskillen and the Enniskillen Collegaate School. I walked,cycled and took the bus to school. 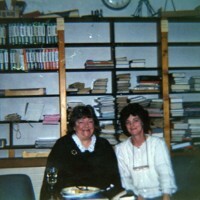 A photo of Maura Corr with Maeve Binchy. 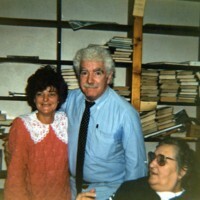 A photo of Maura Corr with her friends from her writing group.